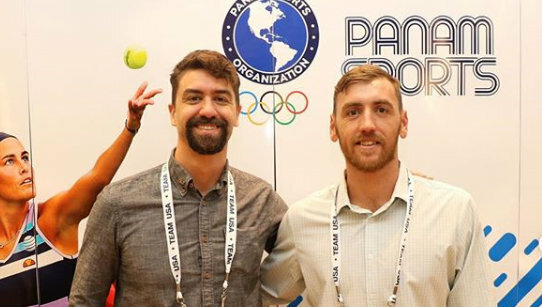 The largest and most engaging Athlete Forum ever held by Panam Sports, with support and funding from Olympic Solidarity, gave athlete leaders of the Americas the opportunity to shape the future of the continental organization and its premier event, the Pan American Games. Bermuda Olympian Julian Fletcher attended as part of the Bermuda Olympic Association’s Athlete Representative. After three days of listening, sharing and debating about the issues most important to them, athlete leaders from the Americas have a renewed focus to find and develop their voice within their own National Olympic Committees. In order to facilitate athletes in their quest for greater representation, Panam Sports is urging each of its 41 National Olympic Committee Members to create an Athlete Commission with a member who has voting rights on the Executive Board of that NOC. The deadline to create such a Commission is December 2020. This is one of the most important of seven recommendations established by the Panam Sports Athlete Commission with guidance from the Olympic Solidarity team of the IOC, created using the invaluable input and ideas from the athletes who attended the Forum. a. All NOCs from the Americas must have an active Athlete Commission in place before the end of 2020 and ensure the representative of the Athlete Commission has a seat and full voting rights on the NOC Executive Board. b. The Panam Sports Athlete Commission will hold its elections at the next edition of the Pan American Games, Lima 2019. Only NOCs with an active Athlete Commission will be able to put forward a candidate. c. Strengthen effective communication among different Athlete Commissions with relevant stakeholders and directly to athletes. 2. NOCs should enhance their administrative and financial support for the activities and the daily operation of their Athlete Commissions. The IOC Athletes’ and Olympic Solidarity Commissions as well as the Panam Sports Athlete Commission should also explore possibilities to provide further support in this area. 3. Panam Sports Athlete Commission and the Americas’ Athlete Commissions should work with Panam Sports and their respective NOCs to encourage them to adopt the Athletes’ Right and Responsibilities Declaration at both the continental and national levels. 4. The Americas’ NOC Athlete Commissions should proactively engage with their respective NOCs to benefit from all programs available to them by the IOC (including Olympic Solidarity and Athlete365) and Panam Sports. 5. In collaboration with their respective NOCs, the Americas’ NOC Athlete Commissions should lead the implementation of the Athlete Career Program (Career+) at the local level. 6. Panam Sports should support the attendance and facilitate the activation program of the Panam Sports Athlete Commission at the Pan American Games and other regional Games within the Americas. 7. Panam Sports to evaluate the possibility of additional accreditations for athletes’ personal coaches at the training and competition venues at the Pan American Games.